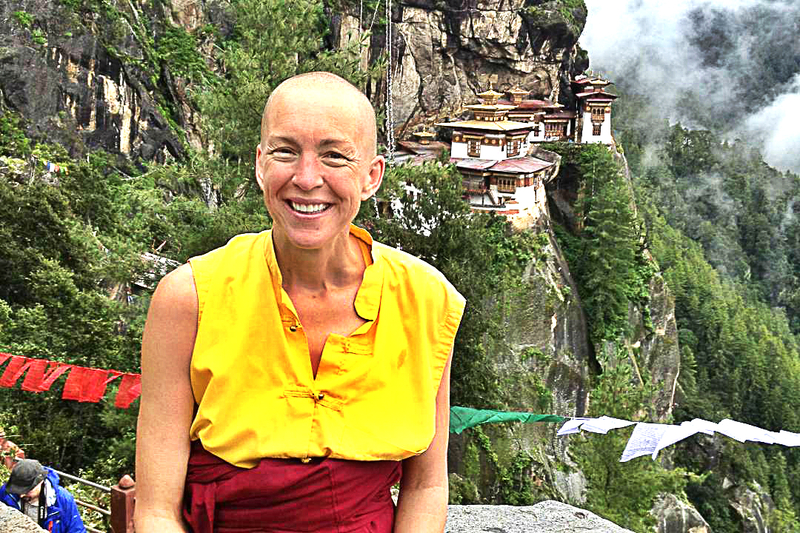 Before she became a Buddhist nun, Emma Slade was a banker. What made her changed her life course was a life-changing robbery incident. She was in her Jakarta hotel when she was robbed by an armed gunman who forced her to the ground. Having plenty of money with a name to match didn’t spare her to experience such a dreadful fate. After that incident, she took a trip to the Himalayas, and after spending time with a lama or spiritual guide and studying Buddhism, she swapped her luxurious life for spirituality. She never returned to the banking world; instead, she runs a charity known as Opening Your Heart to Bhutan. After she found the 5 ultimate keys to happiness, she never traded it for anything and live her life for it. Here are the keys to happiness according to Emma Slade, a Buddhist nun! 1. Take the best out of every bad situation. Avoiding bad situations is part of a typical human being’s behavior. We abhor bad situations because they don’t feel good. While the avoidance of trouble keeps us safe, the very trouble we avoid is what changed Emma Slade’s life. It was the main trigger to Emma’s spiritual awakening. The complete loss of control over her own life during that fretful attack left Emma a profound sense to look at her life more closely. And while she was up in the mountains of the Himalayas, she found complete happiness. She realized that even from that fretful event there are positive things that came out. Most of us are not very good at noticing these positive things contained within every situation, and according to her, that’s the key to stop resisting, feel at peace and unlock happiness in your everyday life! 2. Practice forgiveness and empathy. Emma Slade has only compassion and forgiveness for her attacker. She managed to replace hatred with empathy because she has found peace, which she greatly attributed to the person who has done her injustice. If not for that life-threatening incident, she would not have become the much better person she is today. She has discovered kindness and understanding because she has allowed herself to feel them. She learned the most important lesson in her life from the very person who was supposed to destroy it. To be able to forgive means you are able to heal and move past what happened. When you heal your heart from the past you are able to feel all the beauty of the now! 3. Make finding peace the priority. According to Emma Slade, peace is not something that you have to wait to come your way; it’s something that you have to seek actively. She journeyed to the Himalayas for physical and emotional purposes, and it led her to find peace. We could make finding peace a priority in our life. It’s even better to seek it before seeking achievements or making purchases that only add up to the extra baggage on our journey. Finding peace should never be compromised for anything or anyone. And it’s not something that requires you to have anything external in order to achieve it. In fact, the people who have most of the material things they thought would bring them peace live the least peaceful lives as they are scared of losing those things. 4. Practice activities that enhance your state of calmness. Many people have followed the practice of meditation and mindfulness in achieving inner peace, but these are not the only ways to finding peace. Connecting with nature or owning a pet can also help. Listening to music, talking to people you feel close to, or just unwinding your thoughts by drinking a cup of coffee can all be your choice of an activity that enhances your state of calmness. Creativity is a great tool in finding a calm state as well. You can express your creativity by journal writing, painting, or creating music. Most of all, a healthy mental state follows a healthy physical state. Thus, you should ensure to look after your health and stay fit so that finding peace is easier. Eat organic, locally and healthy, exercise and sleep well. You will help your state of calmness to come more easily whenever you practice these activities. Buddhism teaches kindness to all creatures: humans, animals, plants, and trees. It inspires us to actively and consciously choose to be a bigger person with a more positive attitude. Being kind to someone who has been rude to us is gaining more than losing something. Always do good whether you receive something in return or not. What matters is you are becoming a much better person by randomly choosing to do good with each person you get the chance to meet every single day. Buddhism is a peaceful philosophy for life and it’s filled with love and compassion toward all beings. Following these ideals will help you introduce more love and happiness in your life and you don’t have to be a strict follower to do that!